Victor Hugo tells his classic story of redemption and struggle, now a major motion picture, of a tormenting police officer and a former convict. 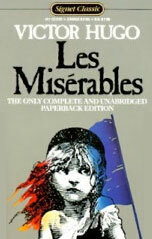 The book, first published in 1862, is set in 19th century France and still captures imagination and emotion today. Hugo develops the plot beautifully as former convict Jean Valjean struggles to escape his past and is pursuer Inspector Javert. If you have not read this book yet think about enjoying this great work of fiction before going out to see the motion picture.